Manufactured in our Haslett, Michigan plant. The First ALL ALUMINUM Curtainside in the World. 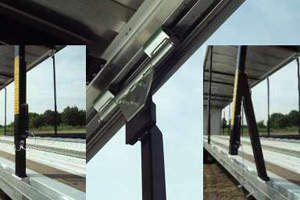 SSI uses the exclusive VERSA rail in all of our curtainside units. Lighter than the competitors standard rail, the VERSA Rail offers superior strength and less "sag" when all roof supports are out of the way for loading. This all aluminum one piece extrusion is proprietary to SSI units and has proven to offer superior service over years of on the road use. SSI curtains are proudly constructed of Mehler fabric, in a 28 oz weight as standard. All of SSI's curtains are horizontally and vertically reinforced with webbing to give added strength. This heat sealable webbing is made of high tenacity polyester yarn with a PVC coating for abrasion resistance and welding ability. The webbing is 1 7/8" wide and .04" thick. It's breaking strength is rated at 2,900lbs @ 68 degrees F.
The end result is a strong and taut curtain that doesn't look wrinkled. We stock a variety of colors to select from, and can custom order "special" colors. Custom artwork as well as digital printing is available on curtains to portray your company message to all on the roads. 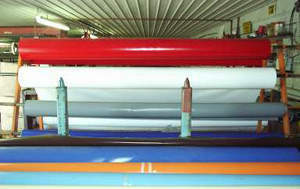 Sliding Systems, Inc. developed and pioneered the production of the NON REMOVABLE Rolling Post. Designed as a roof support device, it is not recommended for load containment applications. 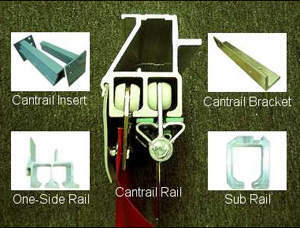 It stays attached to the Post Roller which is safely and permanently mounted inside a track of our rail. Operation is very simple: un-pin, roll it away to any position, then roll it back and pin it again to lock it. The Rolling Post is always there,, not left at some customers dock. SSI developed the revolutionary Aluminum Quick Closer. It is mounted at all four corners of the unit and is an integral part of the wall construction. The Quick Closure assembly features a one-piece aluminum extrusion wall and wing, also called flippers. Two Adjustment Blocks, located at top and bottom, are for custom tension adjustments. The J-Channel, attached to each end of the curtains are hooked on to the wings, and closed in a split second. No more winding and winding of curtains with cumbersome poles, the SSI Quick Closure is simple, basic, and efficient. Snap to open and snap to close using the latches. We keep it simple! The Quick Closer wall is 1/4" thick and measures 2"D x 10"W. The Aluminum Quick Closer is designed for bolt-on applications and will help in reducing weight. Introduced early in 2002, it is proven durable with units on the road today.